When choosing between BJP and opposition parties like Congress for the Lok Sabha elections remember the real scandal is lack of jobs, not jobs data. Unlike what many people have come to believe, members of the council of ministers (the cabinet) have complete authority over the ministries they head. The prime minister is the head of the council of ministers and chooses his or her cabinet colleagues, but the council as a whole is collectively responsible to the Lok Sabha. While some prime ministers, like Jawaharlal Nehru, Indira Gandhi and Narendra Modi, have dominated their cabinets, the Constitution does not envisage an all-powerful PMO that directs individual ministries on policy matters. The relationship between the prime minister and his or her cabinet colleagues is not one where the latter are subordinates. Modi changed this in practice once he became the prime minister in 2014. The BJP’s election campaign promises the voter more of this should the party return to power. It is, therefore, just as well that the Congress and other parties opposed to the BJP are not offering their own presidential candidate. Partly by design and partly due to circumstances, the fact that the opposition is not putting forth a strong, unequivocal prime ministerial candidate ensures that the election remains parliamentary, as it is meant to be. While the election rhetoric might suggest that this is a referendum on Modi as the BJP would have it, or a manifesto for a new welfare state that the Congress promises, the deeper choice is one between majoritarianism and redistribution. You can’t compare apples and oranges, but as voters, we’ll still have to choose between them. How will either of them tackle the smog of resentment, grievance and anxiety that has settled on the country over the past few years? How will either of them generate economic growth? Majoritarianism without growth will devour its own, while redistribution without growth will drive us to ruin. Days before the elections, we have no idea what the BJP, Congress and the others will do to restore economic growth. India’s biggest short, medium and long-term challenge concerns jobs. The real scandal is not the lack of jobs data, but the lack of jobs. The required run rate is 20 million jobs per year; our best and current run rate is 2 million per year. In other words, we need a ten-fold jump in job creation. That is the only way we can address rural distress (by getting surplus rural labour out of agriculture), urban underemployment and provide meaningful occupations to the millions of people entering adulthood every year. This is a challenge that is unprecedented in scale and scope and missing from the electoral debates. We are offered more nationalism and more redistribution: neither of which is a way to generate massive employment. We are like a patient who needs to select a surgeon to carry out a complicated operation, being asked to choose between a good-looking doctor and a guitar-playing one. It is both lazy and irresponsible to conclude that all options are equally bad, so let’s just vote ‘none of the above’. That would be a cop-out. It could also put in place a government worse than we might have willfully chosen. There is a local dimension to our political choices: In fact, it is on this that we actually exercise our franchise. Sending the best person, or the least worst person, on the ballot to the Lok Sabha is an important and useful thing to do, in itself. Ultimately, there is also a moral dimension to our political choices, and it has an important role to play at these times. The article was written before the Congress published its manifesto. This article does not do justice to the BJP. They inherited a dying economy. And they never had a majority in the Rajya Sabha with which to make laws, unless the Congress co-operated. It did only on the risky GST, but not on land or labor reform. The BJP have done much of the groundwork to revive the economy – this article has no suggestions for the next 5 years. Large economies take time to turn around – improving the ease of starting business, promoting make in India and business restructuring laws will reap benefits in the next 5 years. Not to mention the lack of corruption which will encourage foreign investors. The prevailing scenario, both domestic and international, demands a strong leader. He or she may be from any party. Domestically, terrorist and secessionist tendencies are emerging fast. Internationally, the situation is not friendly. The situation in Afghanistan is fluid. This region of the subcontinent had always played historical part in India’s destiny. And hence Modi seems to be the only choice as opponents have not been able to offer any other as their undisputed leader. Thanks God this type of articles are not read by 99 % of the people who constitute voters . these are read by the readers, researchers, your fellow media persons, who have to write rejoinders or appreciation of authors line . Common man wants the leader at national level which can assure security to nation , country s image in foreign countries , visible growth in infrastructure , lower inflation and uninterrupted availability of essentials goods and services. –power, petrol, gas etc. Modi s performance on all these parameters is better than any of his predecessors during last two decades. ( That includes both UPA and NDA governments. ) Is there perceptible change or not, is visible to most of the common people? Whether a Government has been successful or not is very much clear to most of them. Poverty, unemployment , regional imbalances in growth, caste discrimination s did not arise post -2014. most of the common people understand whether incumbent government has addressed these problems or not and that is closely watched all the five years not just 100 days before the election. On personal integrity Modi Ji is miles ahead from previous incumbents. There was no significant dip in Modi ji popularity as reported by media from time to time . Hence don t worry the Indian voters are going vote rationally during April and May 2019. Jai Hind. This is a very subjective view devoid of any real data – except for quoting 20million people entering jobs market per year. There is no ways one can say or contradict authoritatively Narendra Modi’s style of dealing with various ministries, unless the ministers come out and tell different stories. In fact the real, on the ground scenario is that Narendra Modi government has very well preserved and fostered fabric federalism. All the states have got their due without any bias or prejudice. All the ministries have got their autonomy to chalk out and execute the plans – look at functioning of Home ministry, road transport, railway, I&B, sports.. every ministry has worked very well. So author – Nitin has just given his subjective view. 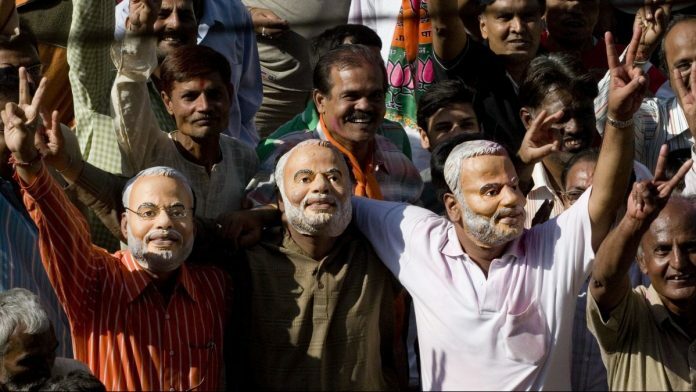 The last part – local dimension is an attempt to persuade voters to not look at strong leadership of Narendra Modi ji. It is an attempt to shield Rahul Gandhi from getting compared to Narendra Modi. So I would urge readers to apply the caution and understand the bias that writer is projecting through this article. Having observed each general election since 1977, one can say, It is not an equal choice between incumbent and challenger(s). It is a referendum on how well the government has performed over the last five years. Do voters believe it deserves another term, is their own family’s graph something they would wish to see move for another five years in the same direction. Mocking the opposition, or individual leaders, will not be good enough. In fact, a majority of them are regional leaders who have been chosen by their people to head state governments, some in office for close to two decades. The bar is set much higher for the incumbent. One cannot recall a single national incumbent getting reelected on anything extraneous, other than a fair summation of its own record in power. The opposition would be well served to focus like a laser beam on the Report Card. As an individual I am not bothered about constitutional niceties blah blah. I agree it’s between Nationalism and redistribution. But Modi is clean and am afraid to say this about Congress/Rahul!